This entry was posted on October 20, 2015 at 7:37 am and is filed under Uncategorized. You can follow any responses to this entry through the RSS 2.0 feed. You can leave a response, or trackback from your own site. It is that. But oh what style! It’s been pretty interesting reading reviews for this, it sounds like a rather uninspired entry in a typically creative canon for del Toro, minus the visuals of course. Idk if that’s enough for me to go check it out; maybe I will on half price night or something. That still feels weird to do though with a Guillermo del Toro movie. . . . . I was really hoping this was going to be Guillermo del Toro’s biggest hit ever. Unfortunately it tanked at the box office. Understandably audiences don’t seem too keen on it. No that’s odd. I’ve so far only read one overly positive review for it. One. Very stylish. Scenes looked very eerie and beautiful. Story was good, but entities were typical cgi. 3 stars. Agreed that it looked beautiful, but story? Not a fan. 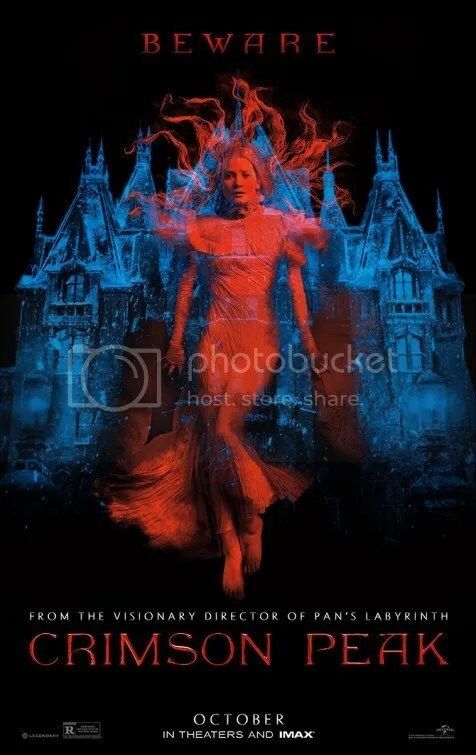 As I watched Crimson Peak, I knew the story had been done many times over. Normally that would bother me, but this film was a rare instance where I didn’t mind because everything was just so lush from the special effects to the costumes, and the music. The movie’s ghosts creeped me out (even though they’re just a metaphor) and its gore was chilling to me too. Short story: I totally fell for the atmosphere it created and I was able to overlook its “feeble script” as you call it. Totally not sorry about it either. Haha. It certainly is lush. Glad you enjoyed it.